When I had first seen these books on shelves, I didn't think too much of them. Having our familiar Star Wars characters dealing with a race of insects didn't seem all that interesting to me, so I sort of skipped it. But when I had started on the Legacy of the Force series of novels, I realized that it was hard to appreciate those books without first addressing he events that had taken place here. And that's both the good thing and the bad thing about the new Star Wars books. Ever since the transition from the Bantam books to the Del Ray books, we've moved away from semi-autonomous books that happened to be within a larger universe of stories to a more cohesive, serial narrative, it's gotten trickier to read the books out of sequence. 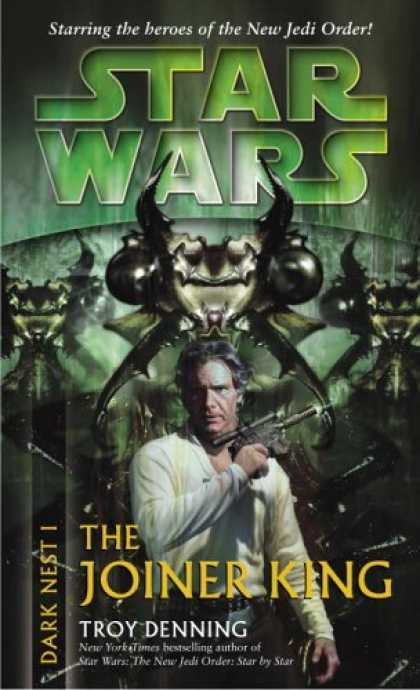 And thus it is hard to truly enjoy Legacy of the Force without having first read the Dark Nest Trilogy titles first. In that sense, you have to respect this strategy from a publishing standpoint. It must do well for book sales, provided your readers are committed enough to the franchise as a whole. I'm not quite sure how to feel about these books in particular - they seem to be a bit of an acquired taste, which was surprising given I had enjoyed Dennings work on the New Jedi Order books. 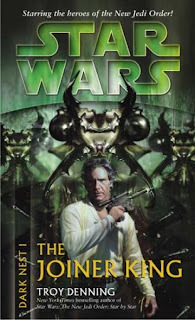 Synopsis: Star Wars: The Joiner King is the first book in the Dark Nest Trilogy of books. The book takes place about 6 years after the conclusion of the events in the Yuuzhan Vong war. The book begins with several young Jedi suddenly abandoning their respective missions to make their way to some unknown destination. They're all responding to some sort of call that only they can perceive through the Force. The only thing that they all have in common is that they were all part of the mission to Mykyr back during the war - the same mission where Anakin Skywalker had died saving his companions. Thus Luke Skywalker and the rest of the Jedi Masters are left puzzled by what could have drawn so many Jedi Knights away. It is revealed that they have all gone off to aid a race of insect-like aliens known as the Killiks in a border dispute with the Chiss Ascendancy. Naturally the Chiss go to Chief of State Cal Omas to complain about the Jedi's direct, practically military involvement in the conflict, but Luke reminds them that the Jedi Council does not control its members so strongly given their new philosophy towards the Force. But given the situation, Luke together with Mara, their son Ben and Jedi Master Saba Sebatyne to investigate the matter. Han Solo and his wife Leia come to a similar conclusion and make their way to Killik space as well. Now I can appreciate the effort the author goes into to describe just how different the Kilik race is. It's more than just their appearance - the early encounters that our heroes have with them become a bit of an educational experience as we see how their hive mind operates and their logic towards property and things of that nature. It does get a little quirky. However the eventual theories around their motivations, the nature of the "Dark Nest" that defines the series of novels and other more complex pieces isn't always that great. Without going into spoilers, I can sort of appreciate the logic behind some of the elements but in the end I just don't quite buy some of the answers. If that is more because I have somewhat higher expectations with more cerebral plot points, that may ultimately explain things. Otherwise, I don't really know how to comment. At the end of the New Jedi Order books, supposedly we progressed to a new era in the Jedi Order with a wider understanding of the role of both the Light and Dark sides of the Force. But as we start this book, it's not at all clear as to what's going on and where exactly they've gone in terms of this supposed new philosophy. If anything, I feel like they're all confused about what direction is and I don't quite see this new understanding of the Force at work. The book has its usual assortment of lightsaber battles, ship-to-ship conflicts and other big fight scenes. And these parts are probably the more enjoyable bits in the story even if we don't always have to see the logic in how they got into the conflict in the first place or what the heck is going on at times. I do appreciate how well Denning handles the interactions between Han and Leia. He seems to have an innate understanding for how their dynamic works. It feels a lot like the fun, relaxed bits in the movies and in the Expanded Universe books (but not all of them, I admit). He is able to perfectly capture their dynamic as a married couple despite their highly diverse backgrounds as smuggler and diplomat and how the two just work so well together. Plus there's the unique role that they play in the larger scheme of things in the new post-Yuuzhan Vong universe. Star Wars: The Joiner King is an interesting enough new adventure in the Star Wars universe, but not exactly one that will become a true favorite for me. I'll continue to read the books just to get it over with, but don't expect me to fall in love with the story anytime soon. The book still merits a passable 3 samples of qthe quirky Killik language out of a possible 5.